Uses: Religious Lengths: 13 panel 24'-1" Heights: 6'-0"
Alpine Chapel in Lake Zurich, IL, offers a weekly Bible study for women in the community. The hour and a half session begin with a short time of worship in the sanctuary of this religious facility. 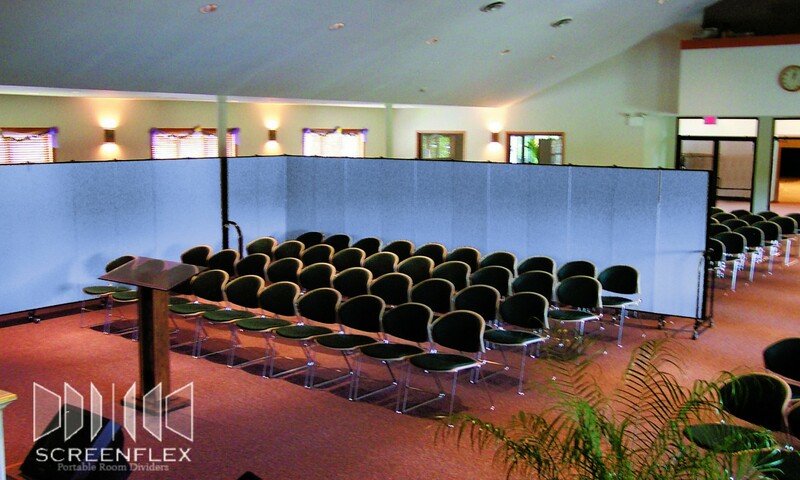 To best accommodate the size of the group and create a more intimate worship experience, the staff uses Screenflex Room Dividers to separate the sanctuary into a quaint room. Following worship, the women take part in a small group session throughout the church to discuss the study, prayer, and fellowship with one another. Room dividers are used to divide a study room in two. This way, they can accommodate more women. When the study is complete, the room dividers roll into the Sunday School classrooms to create two rooms. Additional dividers store in a 2’x3′ space until needed for the next event. Screenflex portable walls are available in 6 heights and 6 lengths and 38 Colors choices. Units ship fully assembled and ready to use.